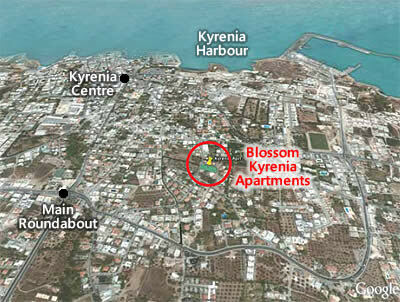 Blossom Kyrenia Apartments is one of the best properties listed in Cyprus44 property reviews. The Blossom Kyrenia Apartments are that rarity in North Cyprus, a new development in the heart of Kyrenia. 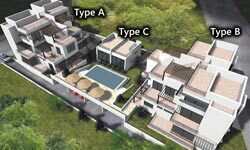 The apartments have been developed by Blossom Properties Ltd, a company which have specialised in building luxury villas and apartments in North Cyprus for 25 years. Blossom Properties Ltd have a proven track record of delivering quality developments on time, not only in North Cyprus, but also in the very exacting markets of the United States of America and Germany. Blossom Properties have agents in both the UK and Cyprus, and even offer a 24 hour service for their customers, should you need it! Following the golden rule of buying North Cyprus property, namely "location, location, location", the Blossom Kyrenia apartments are a real winner. The site is in a quiet yet up-and-coming neighbourhood of Kyrenia, near the historic Turkish Quarter. From here, it is just under a ten minute walk to the historic Venetian harbour with its restaurants and lively atmosphere. The site also enjoys great access to major transport routes, so holiday rental clients won't need a car to explore the town or further afield. The Blossom Kyrenia apartments are within a gentle stroll of every amenity you might need, from bars to banks, supermarkets to shop, cafés to casinos. By motor transport, Blossom Kyrenia is a 2 minute ride from the seafront, 5 minutes from sparkling sandy beaches, 15 minutes to the spectacular Korineum Golf and Country Club, 20 minutes to Nicosia and 35 minutes to Ercan International Airport. The Blossom Kyrenia apartments offer you a choice between two main apartment buildings (A and B) and a poolside duplex (C), in an attractive 'stepped' contemporary design ensuring both privacy and full sun terrace access for all apartments. The shared pool is in the middle of the rectangular plot, and if you were wondering where you might park your car in the middle of Kyrenia, the development's private parking lot is directly under the poolside terrace! The two bedroom penthouses offer a dual aspect open plan living room, dining area and kitchen, with two bedrooms and a small bathroom to the rear. However, you'll probably spend most of your time deciding which terrace to sun yourself on, either the main terrace at living room level, or the upper sun terrace with views both towards the sea and back to the Five Finger Mountains. These terrace spaces alone can add up to an impressive 67sqm, and the largest apartments offer 125sqm, so there's plenty of space to stretch out and relax. Prices start from £64,950. The first floor two-bedroom apartments each have access to their own poolside terrace, so these are ideal for those who love to swim and sunbathe. These apartments also feature an open plan living area with modern fitted kitchen, and a shared bathroom between the two bedrooms. Prices start for the four remaining apartments at £48,950. If you wanted a second floor two bedroom apartment, or one of the duplex one-bedroom apartments, sorry, you are too late - they have sold out! As you would expect from such as good-looking development, the build quality is good, with all the touches both you or any holiday rental clients will appreciate. The apartments have ceramic tiles throughout, fully fitted kitchen units, fitted wardrobes in the bedrooms and aluminium double-glazing throughout. There are satellite tv sockets in the lounge and master bedroom, a plasma tv spot in the lounge and plenty of electrical sockets in each room. Optional extras include marble floors, air conditioning, ceiling fans, plus a furniture and white goods package. Perhaps what makes the Blossom Kyrenia apartments a serious consideration for any Northern Cyprus property investor is the four-year 10% rental guarantee the developers are offering. In effect, this amounts to the same as a 40% reduction in the property price, albeit spread over four years. Wile the quoted 25% increase in property prices and parallel increase in rentals over the last three years cannot be guaranteed into future years, 10% income is still a substantial sum, and more than most UK banks would offer in interest or on an investment bond. If you want to invest in a North Cyprus property that will appeal to more than just holidaymakers looking for the nearest beach, the Blossom Kyrenia apartments are well worth looking at. Their location in Kyrenia ensures that those who want to stay in a town can walk to local shops, restaurants and sights with ease, yet they can also park their car if they want to explore North Cyprus more fully. Blossom Properties also mention that the apartments are close to the free bus services that run to North Cyprus' two university campuses, with their ever-growing body of students and staff looking for quality rental accommodation. However, we feel that once you've seen these quality apartments, and felt that warm North Cyprus sun on your face, you won't want to let it out all year but save the best weeks for yourself! This web page is served on 20 April 2019 at 00:10:12.